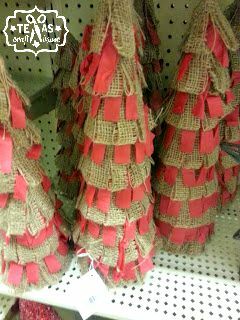 I was walking around Hobby Lobby looking for a crafty inspiration and found these cute little Christmas trees. 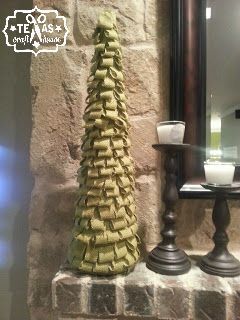 I loved the idea of burlap being used to create these Christmas trees… But when I flipped it over to check the price I was shocked to see $29.99 EACH! I mean they were cute… but not that cute. There is no way they were worth that much. So I turned the cart around and went shopping for the supplies to make it myself. 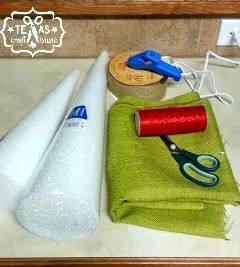 I grabbed foam cones the sizes I wanted for my mantel (don’t forget about your 40% off coupon), a yard and a half of burlap (this was the hardest part, so many colors of burlap to pick from! ), and some extra glue for my glue gun. I ended up not using that red ribbon or the burlap ribbon below. 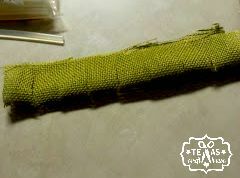 Just the green burlap (loved how the color turned out). 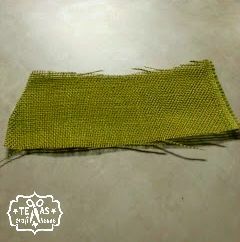 First, I cut a strip of the burlap horizontally. Don’t worry if it starts to fray at the ends you’ll cover that in just a minute. 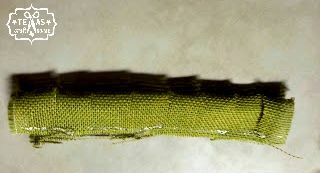 Then I folded it “hotdog” style (sorry kindergarten teacher here) and glued the raw edges together with the hot glue gun. 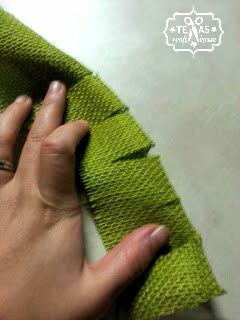 After gluing the raw edges I cut little slits along the fold to form the “leaves” of the tree. Don’t cut all the way up. 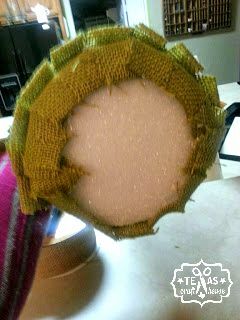 Then glue the raw edges again on one side and use that to glue to the foam cone. Make sure to take off the plastic wrapper before gluing to the cone. 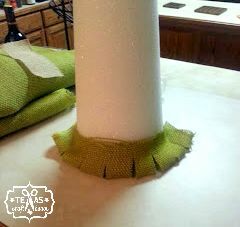 Start gluing the green burlap onto the bottom of the cone. 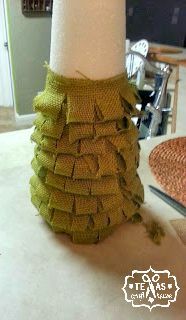 Don’t worry if the burlap starts out too long, you actually want that. I’ll show you here in a second. 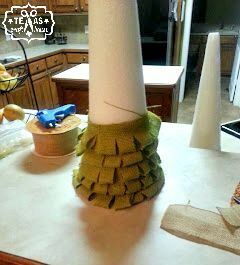 Cut out more strips of burlap, glue the edges together and cut slits again and just keep adding to your cone. 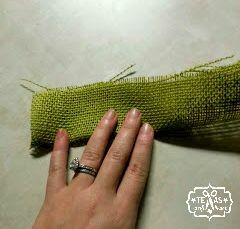 Once you are up a couple rows of “leaves” turn the cone to the side and glue the pieces that are long at the bottom underneath. Then just keep cutting, gluing, slitting and gluing onto the tree. Slowly work your way up to the top of the tree. I am added a gold glittered ornament to the very top to look like the tree topper. You could also find a gold star ornament. I considered cutting a star out of cardboard and wrapping the star in twine and adding it to the top of the tree too. So many opportunities! I am so happy I decided to try this craft myself. I love it so much more than the ones you can just buy… and the homemade ones are way cheaper. 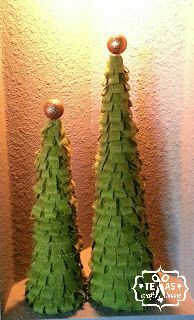 It cost me around $15.00 for the supplies for 2 of these cute trees . The ones you can just buy were $29.99 each! 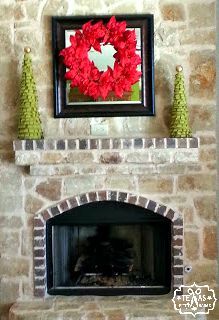 They look great on your mantel. Thanks for following my blog. I love Christmas! I love un-traditional Christmas trees. I’ve been making them out of upside down tomato cages. check it out, I think you will want to make some for yourself.